WhizComms Partners Zero Mobile to Benefit All its Subscribers with the Lowest Priced Unlimited Calls, SMS & 4G Data Mobile Plans! For the 1st Time Ever, WhizComms Partners Zero Mobile to Benefit All its Subscribers with the Lowest Priced Unlimited Calls, SMS & 4G Data Mobile Plans! At only $59.95 (Usual Price $69.95), WhizComms subscribers can enjoy unlimited perks for their mobile plans with Zero Mobile! Upon signing up for Zero X plan, customers can make international direct dialling (by dialling 1516) at a cheaper rate with Whiz 1516 IDD service, savings at up to 87% compared to other mobile telcos. 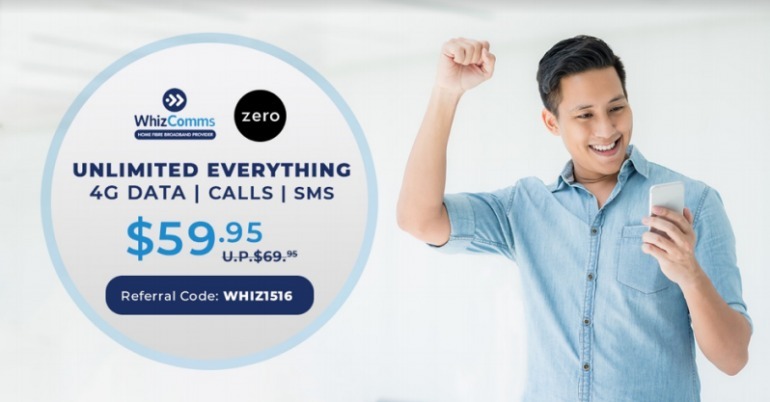 Register now at https://www.zeromobile.com.sg/register–now and enter Referral Code <WHIZ1516> to enjoy the promotion by 31 August 2018. Zero Mobile is an innovative and digital mobile service operator in Singapore with an aim to drive mobile bills down while providing unrestricted allowances for personal mobile devices. Licensed by IMDA to provide mobile services in Singapore at end of September 2017, Zero Mobile have worked very hard to bring to mobile users the best value possible. Zero Mobile appreciates loyalty and attempts to reflect that in all its product offering. Zero Mobile only work with the best network and service providers offer mobile users the best there is. WhizComms Home Broadband deal starts at $34 a month, ends this month!